A bunch of years ago I created the site olddeadvolvos.com to feature pictures of old Volvos both dead and alive. I got the idea from the site olddeadsaabs.com which is no longer up. My friend Jake had this wonderful miniature junkyard containing four classics and it was obvious that we had some decent material to work with. 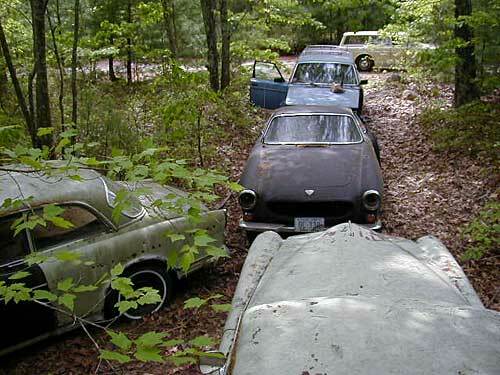 We eventually picked them clean and had the carcasses hauled off- now only the site remains as documentation. To keep up with the times and share Volvo musings perhaps both funny and useful I created this blog. A really good shot of the main collection with Sadie from Sweden in the background. i’ve just found your site. i’m doing this one on fotolog (http://www.fotolog.com/volvo200), but i’m thinking to switch to tumblr. anyway, respect and keep up with old volvo! Thank you, sir. I can’t wait to get my 242GT on the road. It’s been a while since I’ve had a 240 as a regular driver. I might post some 240 ad images so check back soon!